Lower Unit Lube Tube. 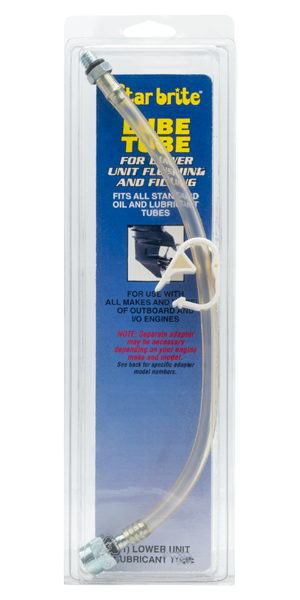 Quick, easy and clean way to change marine lower unit gear lube For use with all 8 oz. and 10 oz. squeeze tubes. Metal threaded fitting fits Mercruiser, OMC, Evinrude, Johnson, Honda (70-90hp), Volvo, Force and Gamefisher lower units. Requires adapter #28401 for Yamaha, Nissan, Tohatsu & Honda Lower units (2-50 hp) Requires adapter # 28402 for Suzuki and larger Honda motors.